State gun laws fill enormous gaps that exist in our nation's federal laws, and help to reduce gun violence and keep citizens safe. In part because these laws help to keep guns out of the hands of dangerous people and aid law enforcement in solving gun crimes, many of the states with the strongest gun laws also have the lowest gun death rates. 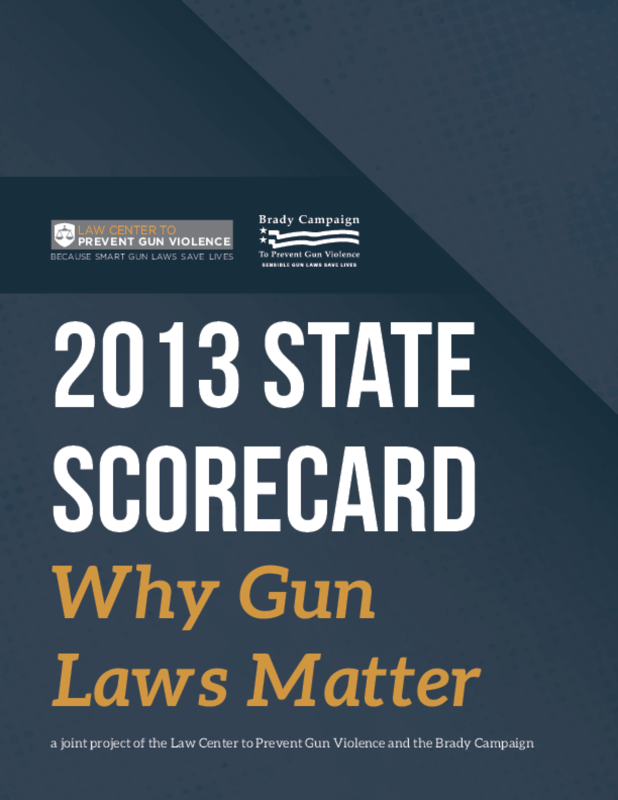 Because state laws differ widely, the Law Center to Prevent Gun Violence and the Brady Campaign to Prevent Gun Violence have teamed up to evaluate and compare the laws of all fifty states, as they have both done in years past. Together, we have ranked all fifty states based on thirty policy approaches to regulating guns and ammunition, such as background checks on gun sales, reporting lost or stolen firearms, and prohibiting dangerous people from purchasing weapons. States received points for having effective laws in each policy area, with stronger laws receiving more points. States lost points for irresponsible measures that increase the likelihood of gun violence, such as laws that allow individuals to carry loaded, concealed weapons in public without a permit. Ultimately, every state was awarded a letter grade indicating the overall strength or weakness of its gun laws. Because so many states enacted strong new laws in 2013, several states received a higher grade than in past rankings. Thanks to new laws enacted in 2013, six states' grades improved compared to the Law Center's 2012 publication Gun Laws Matter. Copyright 2014 Brady Campaign to Prevent Gun Violence, Law Center to Prevent Gun Violence.